A new page for the book of stamps! Toni wanted an owl for her jewelry making and asked if I would carve her a stamp. The one in the center will be coming soon in some form of earings from her! I’ll let you know when they are available! Meanwhile I’m still trying to get more depth in my circle paintings. More on that later! It is trying to get warmer here in south Jersey not too springlike yet but hopefully soon! Then I get to work in the small room in what was a wee garage when cars were smaller! I have some spray finishes I’m anxious to try. And some rusty metal to play with! 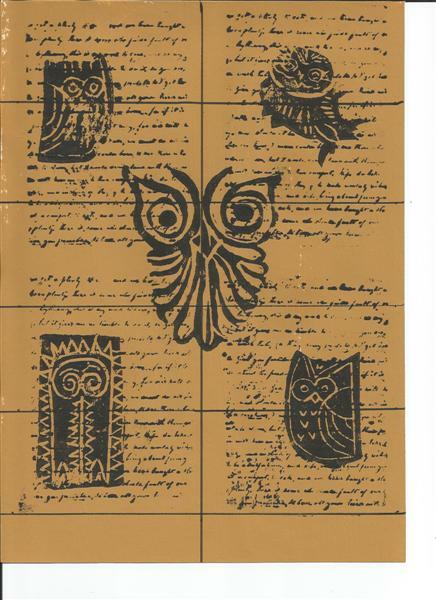 Lyle, I LOVE your study of owls…each one unique. We are now in full blown summer from 12″ of snow to 90 degrees, it must be coming your way. Fabulousa,Lyle!!! Just love these little owl dudes and dudettes! !